Vellutata sauce is an all-natural ready to use sauce based on white spring truffles, potatoes, fresh cream and Parmesan cheese. The mix is surprising and extraordinarily tasty. This truffle-based delicacy is the result of a homemade traditional recipe. 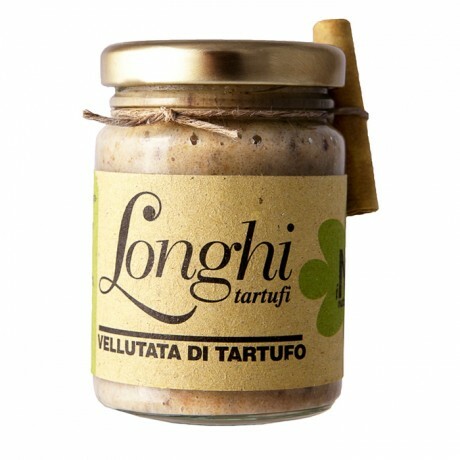 It contains carefully selected fresh in season truffles plus the above mentioned high quality local ingredients: obviously the truffle is what makes the sauce a delight. No preservatives, no added artificial flavorings, 100% natural. Made with 10% truffles, potatoes, fresh cream and Parmigiano Reggiano cheese. Extremely versatile, it can create a great truffle dish in a matter of minutes. A lovely bread topping and unique sauce for pasta, rice, gnocchi or ravioli, it also goes very well with eggs and potatoes. White spring truffles 10%, potatoes, Parmesan cheese, cream, butter, salt.